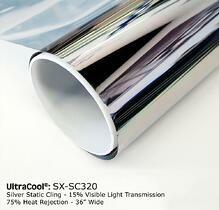 economical solar heat rejecting static cling films available, while maintaining minimal light reduction and maximum glare and heat rejection. A window film with fantastic solar performance specifications which also blocks out 99% of the UV rays! It is also a reflective silver privacy one way film that provides excellent one way visibility and daytime privacy. It can be installed onto glass, Acrylic or polycarbonate sheeting.